I’ve always wondered how people in Medieval times sailed. I was told by the captain that it was much more difficult because they did not have motors and modern technologies such as GPS and weather forecasts. Sailors had to rely mostly on experience and observation. I find it really amazing. And I feel fortunate that we have the resources to sail safely through the oceans. What makes the Gato Verde green? First of all, Gato Verde is the first Catamaran in the Pacific Northwest to make use of biodiesel. Gato Verde also uses LED lights on the boat, which are more energy efficient. The Gato uses lead-acid batteries, which are recyclable. These batteries only allow the Gato to go full-throttle for about 30 minutes (to be prudent). There are other types of batteries, namely nickel-metal and lithium. Lithium batteries are lighter and has twice the power of lead-acid batteries. To make the Gato more green, captain Todd has been considering adding solar panels to the boat. On the boat, we make use of our resources sustainably. One good example is using sea water to wash dishes. It really worked for me as I usually prefer to rinse the dishes until they are spotless. I could do so without worry with sea water because we never have to worry about running out of sea water. The dishes are given a brief freshwater rinse after being thoroughly washed with sea water. We learnt during a discussion the difference between “black water” and “grey water”. Grey water is waste water from washing. 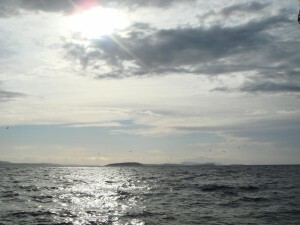 Usually, grey water from a boat is released directly into the open sea. It is worrisome to think about the potential harmful effects of surfactants on marine life. In the United States, boats are required to “pump out” their sewage at designated pump out stations. In Canada, however, boats can release their raw sewage into the open sea. This is worrisome. If sewage gets into freshwater sources, there is concern about contamination of drinking water. This is not a concern with sea water as we don’t drink sea water. However, by releasing sewage into the sea, we are releasing hormones, drug metabolites, and terrestrial pathogens into the marine environment. That can be harmful to marine life. Usually, raw sewage can be treated to remove harmful materials before being released into water. In not so long a time we have learnt that ropes should not be called “ropes” but “lines” and “sheets” on the boat. Ropes the keep the sails in place are called “sheets”. Typically, a sailboat has a jib and mainsail. The jib is smaller than the mainsail, and its orientation is changed during tacking. Tacking is a sailing strategy where a boat sails zig-zag close reach, about 45 degrees to the direction of wind. Beam Reach is where a boat sails across the wind, approximately 90 degrees to the direction of wind. It is also good to remember the parts of the boat, especially when deploying the dock lines and fenders. The front of the boat is called “bow” and the back “stern”. On the boat, the direction to the front of the boat is “fore” and the back “aft”. With this special language, the boat seems to be a world of its own. He had a good point. At times, the day wore on without news of the whales, and even though we worked hard at taking physical oceanographic measurements, everyone grew worried that we were not going to get enough whale data. This is definitely something to keep in mind in future endeavours. The emotions arising from “chasing whales” can sometimes get in the way. It’s frustrating, and it makes people anxious. One wonders, what can be done about it? First of all, the team tried everytime to make the best educated guess of which spot in the Salish Sea would be the best spot to meet the whales, taking into consideration logistics such as biodiesel levels and whether there was a need to pump out or refill fresh water. Our Captain Todd had been our anchor the entire time, sharing with us his valuable knowledge and experience in seafaring. The navigation program OpenCPN gave us an edge in planning our routes. The tides and currents played into it, too. Sometimes, the whales were sighted as far north as Point Roberts, and we had to consider the plausibility of making it to Point Roberts and back to San Juan Island for anchor in the evening. As we did made our best effort to put ourselves in the best position, luck often played a part as well. When there is a lack of data, making a decision to chase whales that are a mile away became a dilemma. Nonetheless, despite these challenges, we had a good number of whale encounters. Some might think it too few, but in the end, the exhilaration of whale encounters, no matter how few or many there were, outweigh the frustration and as everyone got into the rhythm, everything brightened into a good day. One of the more challenging aspects of living on a boat is having to cope with resource constrains, communication and mobility limitations. I don’t think I was fully prepared for this before I went on the boat. It only struck me after I had been on the boat for a few days that cell phone connection was intermittent in the Salish Sea, there was limited internet access, and we were not always docked. This was not an easy lesson to learn and I realized that I had to think really far ahead in terms of planning my work. Although we generally had internet connection at Snug Harbor, the connection can get cut off when the boat moves, or sometimes even fail completely. I really had to budget my time and make full use of “internet time”. Moreover, I could not rely on internet being available for the entire night. Both Dr. Kodner and Dr. Buckman, our guest for two nights, were really helpful in helping me cope with this challenge. Most of the time, students use database (SQL) queries to filter and arrange data. This requires internet. When internet is not available, there is only Excel, which has a myriad of useful functions that make data analysis that much easier. Furthermore, Dr. Veirs has suggested that it’s possible to work with SQL as an offline application. That’s something! My case study for this week centered on reducing bycatch of juvenile red snappers by shrimp trawls in the Gulf of Mexico. 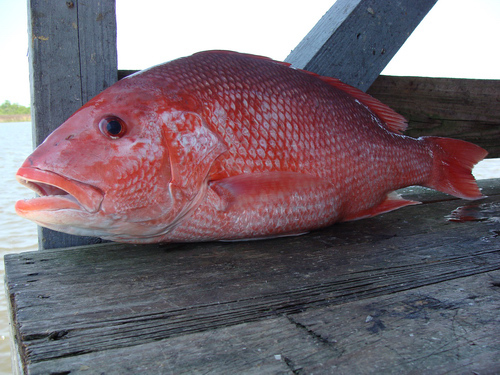 The paper is: Designing marine reserves to reduce bycatch of mobile species: a case study using juvenile red snapper (Lutjanus campechanus), by Diamond et al. The research team made use of geographic information system (GIS) to map fishery-independent trawl surveys done by the Southeast Area Monitoring and Assessment Program (SEAMAP) every summer and fall in the Gulf of Mexico from 1987 to 1997. The paper attempts to asses whether there is a geographic pattern to the distribution of juvenile red snappers. Diamond et al. analyzed juvenile red snapper distribution and examined “hot spots” with high concentration (intensity) and the predictability for the hotspot to reoccur in the same position over time (persistence). In designing marine reserves, one could designate no-trawling zones according to the desired level of intensity and persistence which correspond to percent or numerical bycatch-reduction goals. In further consideration, given that red snappers are highly mobile and higher-intensity hotspots are often unpredictable, a no-trawling zone does not need to be permanent. Ideally, such a no-trawling zone could be fluid from year to year, in order to avoid trawling in higher-intensity hotspots. For a no-trawling zone to be fluid, it would depend on how effectively this information could be disseminated in a timely manner. This could also apply to marine vessel no-go zones in the activity range of Southern Resident Killer whales. In the San Juan community, dissemination of information should be relatively easy due to wide availability of communication technology. Will You Be There for San Juan Islands? How did San Juan Island really look like 200 years ago? Last Friday the S Pod had a case study discussion on sustainability. I chose an article entitled “Global Consequences of Land Use” by Foley et al, published in Science in November, 2005. The article pertains primarily to the effects of agricultural land use on land cover. One aspect I find intriguing is soil salinization, a phenomenon common in agricultural lands. Heavy irrigation of soil, coupled with removal of deep-rooted native vegetation, cause water table to rise near to soil surface. A disturbance such as heavy rainfall can then draw water levels to the root zone. When this water is evaporated from the soil surface, the salt is left behind, causing soil salinization, which quickly deteriorates soil quality. Our Beam Reach instructor, Dr. Scott Veirs, mentioned that one common problem on San Juan Islands is the overwithdrawal of groundwater, causing salt water to seep into the aquifer. This led me to think more about the land and resource usage on San Juan Islands. In a conversation with Jason Gunter, owner of Discovery Sea Kayak, I found out that before English and American settlers arrived at San Juan Islands, the Native Americans practised controlled burning of open lands in order to better harvest bulbs. 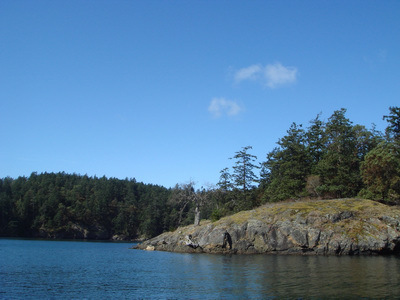 It has been speculated that at the time, many parts of San Juan Island were not forested. The theory is that controlled burning allowed slow-growing trees such as oak to mature. 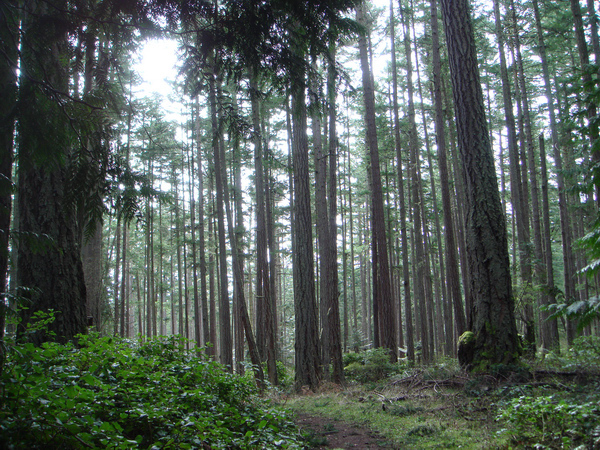 When controlled burning stopped, tall and faster-growing conifers such as Douglas fir out-competed the slower growing species by creating shades. These conifers propagated, which gradually brought about the landscape we see on San Juan Island today. Jason has also mentioned that this change in land cover has caused the loss of a few species of birds. It would be very interesting to find out how land use and land cover have evolved for the past 200 years, and whether this has impacted the local nearshore or marine ecology in any way. Nonetheless, I think it is even more pertinent to study the current land and resource usage on San Juan Islands, in order to modify and adapt resource usage to ensure the continuous availability of these resources — such as potable water and fertile soil — in the future. This week the S Pod, as we Spring 2012 Beam Reachers are now called, discussed at length about “sustainability science”. So, what is sustainability science? Each of us has a unique definition of what sustainability means to us, and many writers have proposed a variety of definitions. My personal definition of sustainability has its foundation in the very meaning of the word “sustainable”. The word sustainable connotes, first, the “capability to be sustained”, and second, “using a resource such that the resource is not depleted or permanently damaged”. In implementing a “sustainable project”, it is important to make sure the project can be continued on a long-term basis. I recently visited a rural village in the Samburu region of Kenya, where NGOs have installed water filters for rainwater reservoirs. However, when I was there, the water filters were not functioning because the NGOs had failed to adequately educate the local community in how to properly use the filters. Therefore, one could say that this project is not sustained, and such a project is not sustainable if the local community does not get involved. How does the above example translate to sustainability science, and in our case, environmental conservation? One of the most important element in sustainability is education. By imparting the knowledge and idea pertaining to one’s project to the local community, the local people could then become the engine of the project, and these knowledge, ideas and good practices could hopefully be passed down to the next generation and inspire students to become field-level experts. Two days ago, Katie Fleming from REsources, an NGO based in Bellingham, WA, shared her experiences in community outreach. She implements a model which she calls “community-based social marketing”. This model markets an environmentally friendly idea or practice, such as to turn off the engine when the car is stopped for more than 30 seconds, by educating school children to influence their parents, giving small incentives, and by adding a “peer pressure” element”. I feel that this is a wonderful practice in sustainability, in both aspects of ensuring the project is sustainable, and in promoting a more sustainable use of resources. Moving on to the second definition of sustainability, which is the sustainable use of resources. The household definition of “sustainability” usually refers to the popular concept: to make use of renewable resources, and to reduce, reuse and recycle consumer products. One aspect of sustainability science could be to use a research method that is in line with the above practice, so that the research could be economically sustainable and have minimal impact on the environment. Sustainability science in a larger scale would be to examine the current state of environment, and to encourage essential economic practices such as agriculture and transport, to move towards the sustainable use of our shared natural resources. Our Beam Reach instructor, Dr. Robin Kodner shared with us her personal definition of sustainability during our round-table discussion. One of Dr. Kodner’s current research project is to measure the level of Domoic Acid, a neurotoxin produced by the diatoms Pseudo-nitzschia, in nearshore waters. Her hypothesis links higher levels of Domoic Acid in the water with altered water temperature or nutrients leached from agricultural lands. Dr. Kodner’s definition of sustainability science is: using natural science methods to study the social and environmental interactions and changes, hence providing the data as a basis of better management and policy. And also, to come up with innovative solutions. 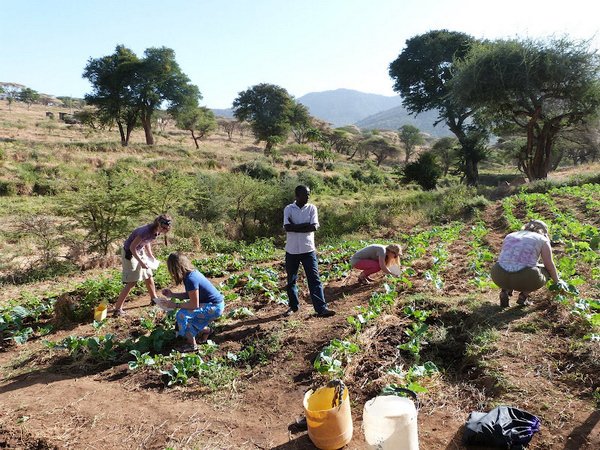 In Kenya, our class did a small insect abundance and variety survey on subsistence farms. Our investigation was brief, but we compared and critically assessed the condition of the two farms. The overarching goal of such a survey was to reduce pesticide use by relying on native species to reduce herbivory on crops. One method is to have weedy margins to agricultural plots. Reducing pesticide use reduces the amount of toxin that could be leached into streams or groundwater, which helps to ensure the sustainability of local water resources. I am really glad that my experiences in Kenya have enabled me to contribute ideas in this class. My current research direction is to find out what aspects of orca conservation might human interest come into conflict against. I look forward to learning more about the Salish Sea and my beautiful classroom — San Juan Islands!